In July 2013, I reported the sad news that Linda Houle, co-founder of small press publisher L&L Dreamspell, had passed away. She died of cancer. I was lucky enough to have had a story published with L&L Dreamspell. 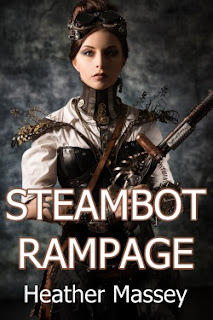 "Steambot Rampage" was in the same DREAMSPELL STEAMPUNK Volume 1 anthology as Linda Houle's story, "Angelina." After Linda's passing, L&L Dreamspell closed. The rights for "Steambot Rampage" reverted back to me. I knew, immediately, what I needed to do with this story. "Steambot Rampage" is now available through Smashwords. I will donate all proceeds generated by sales from Smashwords to the American Cancer Society for as long as I am able to do so. In the interest of transparency, I will maintain records of the financial transactions. I'll also update my blog readers whenever I have news of a substantial donation. Why not pick up a fun story and support a worthy cause? Buy Steambot Rampage now--it's only $.99 cents.